Last Friday I mentioned that everyone was beginning to fret about the sharp rise in the 10 year bond yield (or fall in bond prices). I’m not totally convinced that this will mean real trouble for the equity market. We could experience some turbulence but the underlying uptrend is still intact. Atleast from the metrics that I’m following. I really doubt whether this one data point will mean the end of the bull market. 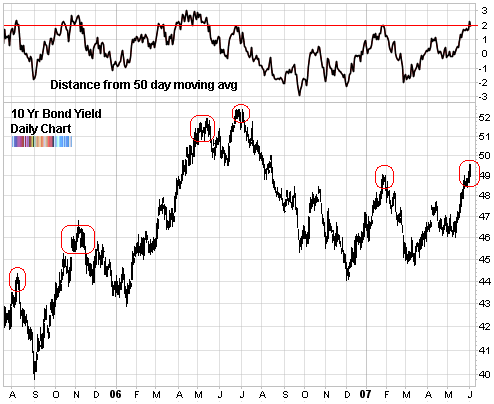 In fact, according to this graph, we are most probably seeing the end of the rise in bond yields. The top graph shows the distance of the daily 10 year Treasury Notes from its 50 day moving average. As you can see, whenever it becomes too stretched to the upside, it snaps back. That’s where we are right now. Of course, it doesn’t have to snap back. The markets are unpredictable. But the only guide we can use are observations from the past. And that is telling us that this recent fall in bond prices is right about over. And if that does happen, it will breathe new life into the equities market. the economic is a prison-house which once you enter its hard to get out of. all these bonds are toads of the same pond. they are serving an evil mission of filling pot bellies. what do the poor get but a pittance. ultimately the system must collapse under its own weight.